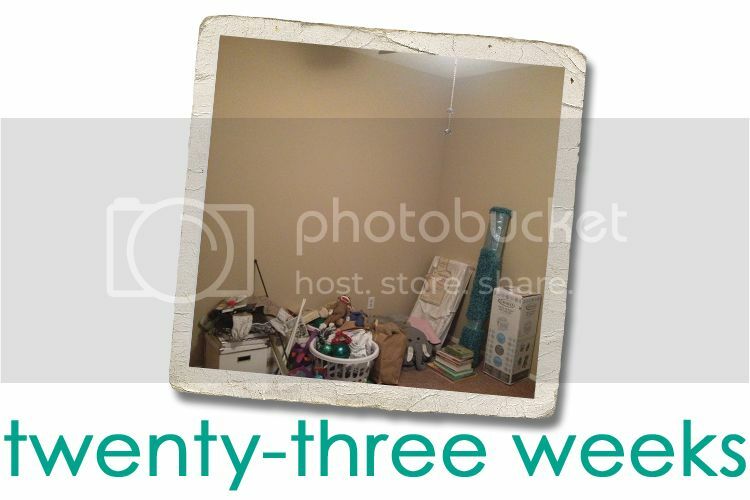 Jordy Liz Blogs: Twenty-three weeks. We finally have a dedicated space for you. It's filling up fast with clothes, toys, and nursery items. When we moved into this rental house a little over a year ago, we knew we wanted three bedrooms. Initially, those bedrooms would serve as our room, a guest room and an office. But at the same time, we wanted three bedrooms just in case we had an addition to our family during our two-year lease. Our addition is you (and the office has been kicked out). This last weekend had been set aside for a couple of months now. Our focus was on creating a space just for you. We moved furniture, cleared out clutter and gave you a room of your own. It's comforting to walk down the hall and know the room is all yours and we're making progress towards what's to come in the next several months. I've been extra hungry this week. I don't know if you're going through a growth spurt or if my eating habits have been off and I just haven't noticed. Regardless, I am downing an extra bowl of cereal at night and still waking up starving in the morning. I'm not a breakfast person by nature, so that's been the hardest meal to figure out. One of my best friends, and someone I hope you get to know, is also expecting a baby just one month behind you. She just found out they are having a girl, so that only makes me wonder even more what you will be. I'm looking forward to Thanksgiving next week. Through the early stage of my pregnancy, I've looked ahead at the holidays thinking I'll be six months at Thanksgiving and seven months at Christmas. I can't believe it's almost here. We are extra thankful for you this year. I love that you write to your baby. Each new life is so special and I am sure this baby will love to look back at these in the years to come! so fun. I would love it if you would add it to the new I am a Storyteller linkup. I think so many people love to read about new life and babies! You are the BEST writer. Seriously... your voice. Love it.